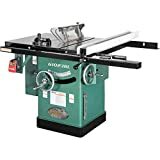 The Grizzly G0690 and G1023RL are both cabinet table saws aimed at the woodworking enthusiast. Both are big, heavy, sturdy machines with 3HP engines and the same size and quality table tops. Both have riving knives and blade guards, nearly identical cutting capabilities, and both would be the centerpiece of any accomplished hobbyist’s shop. If the power tool fairy left either in our garage, we’d fire it up and be thrilled. But if that power tool fairy took us shopping and we got to choose, we’d struggle a bit but eventually choose the G1023RL. The G0123RL has a poly-V “serpentine” belt drive system, which transfers power more quietly and efficiently than a single V-belt system. But the G0690 has a triple V-belt system, which also does a great job at consistently transferring power from the motor to the blade. At the end of the day, both tools get equally high marks for being powerful and quiet. The G1023RL connects the underside of the blade directly to the dust port with a hose, whereas the G0690 just uses gravity to send falling dust towards the dust port. In our opinion, any effort to corral dust before it lands on the floor is a step in the right direction, so we prefer the hose system of the G1023RL. The G1023RL comes with the Shop Fox Classic Fence, which Grizzly describes as hugely popular, but our (admittedly non-scientific) conclusion is that this item is either a love it or hate it kind of feature. The G0690 comes with a fence that is quite similar to the Shop Fox Classic but generates fewer adamant comments, favorable or unfavorable. Since there seem to be fewer people who object to the G0690 fence, we’re going to give it the win here. You will find that the G1023RL is about 20% cheaper than the G0690, so if you are already stretching to buy a cabinet saw, the G1023RL is going to look pretty appealing. 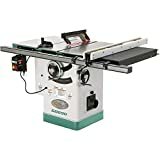 We’re looking at two very similar cabinet table saws here. Users are very happy with the performance, power, precision, and build of both machines. Neither is a bad choice. We give the win to the G1023RL. It’s cheaper and has better dust extraction capabilities. And while you can change out the fence on either machine if you don’t like it, you’re pretty much stuck with the dust collection system.